Early morning as usual Mr.Bhagwat was on his morning walk on Mandoli road, with no street lights he was making his road as he has been doing over the years. But today he just happened to hit the bar of a garbage bin kept by the corporation. 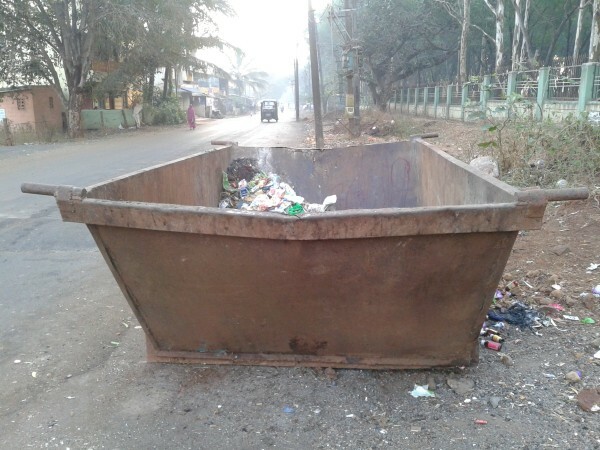 The garbage bin has been placed just next to the road even when there is plenty of space available on the other side. As Mr.Bhagwat just scratched himself at this point a two Wheller who could not see the rod hump braked and skidded infront of inuring himself. The local authorities must take care of such small things as to keeping the garbage bins on the extreme side of the road and see that it is not encroached on the road and the same case with painting and putting of boards for the road humps made. Unsafe road humps on Congress road has already taken one life but we are yet to learn from that we guess. To add to more woes there is the stray dog menace which is also on the rise in the area and with no lights even when it is dark this time around at 6 AM the morning walkers are having a hard time. I am a regular reader of AAB. You have rightly said there is stray dog menace everywhere in Belgaum. This is a serious issue. In the recent days there have been many attacks on children and old people who go for morning walk. I request you to bring this matter through AAB and make the citizens of belgaum aware of this danger.